Gaslamp fantasy (also known as gaslight fantasy or gaslight romance) is a subgenre of both fantasy and historical fiction. Generally speaking, this particular realm of fantasy employs either a Victorian or Edwardian setting. The gaslamp fantasy genre is not to be confused with steampunk, which usually has more of a super-science edge and uchronic tone. Gaslamp fantasy also differs from classical Victorian/Edwardian faerie or pure fantasy in the J.R.R. Tolkien or Lewis Carroll style or from historical crime-novels in the Anne Perry or June Thomson style by the supernatural elements, themes, and subjects it features. Many of its tropes, themes, and stock characters derive from Gothic literature — a long-established genre composed of both romantic and horrific traits and motivated by the desire to rouse fear, apprehension, and other intense emotions within the reader — and could be described as an attempt to modernize literary Gothicism. 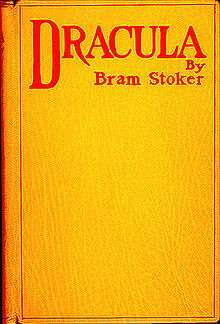 First edition cover of Bram Stoker's ever-popular vampiric novel, Dracula, a common reference for gaslamp fantasy literature. The term "gaslamp fantasy" was first coined on April 26, 2006, by webcomic artist Kaja Foglio to differentiate her comic, Girl Genius, from conventional steampunk fiction. I called it Gaslamp Fantasy because, around the time we were bringing Girl Genius out, there was a comic called Steampunk on the shelves and I didn't want any confusion. Plus, I've never liked the term steampunk much for our work, it's derived from cyberpunk (a term which I think actually fits its genre well) but we have no punk, and we have more than just steam, and using a different name seemed appropriate. I mis-remembered a term that I had come across in the foreword to an H. Rider Haggard book, where the author was talking about Jules Verne, H.G. Wells, Rider Haggard and that sort of pre-pulp adventure material, and came up with "Gaslamp Fantasy." I felt a bit foolish when I discovered that I had made up my own term, but it works and I like it. Girl Genius, although science fiction set in nineteenth-century Europe, does not have a firm emphasis on fantastic Industrial Revolution technology. Elements of other types of fiction are featured, including magic and mythical creatures, and the scientific element of it is less prominent. It also includes steampunk takes on contemporary sci-fi biology elements, like clockwork cyborgs, mass-produced Frankenstein-type creatures, and other monsters. Generally, the term refers to fiction based in a Victorian-style setting, similar to steampunk, but with a broader emphasis. The stories are usually not so focused on machinery of the period (or, often, any machinery at all), take more liberties with the actual time period, and may contain elements of other genres. Since the term's coining, gaslamp fantasy has been retroactively applied to other fiction written in the Victorian Age, such as the works of Bram Stoker, Jules Verne, and Sir Arthur Conan Doyle. Gordon Dahlquist's "The Glass Books of the Dream Eaters" (2006) and its two sequels. Three strangers, a young upper class woman, a medical officer and a hitman, becomes allies as they try to stay alive after their discovery of a powerful and dangerous cabal which use alchemy as a tool to fulfill their plans and ambitions. Bryan Talbot: The Adventures of Luther Arkwright a graphic novel set a world based on Victorian England and followed up with the sequel Heart of Empire. Gaslight Grimoire: Fantastic Tales of Sherlock Holmes – eleven short stories by Barbara Hambly, Kim Newman, Barbara Roden, Bob Madison, Christopher Sequeira, Chris Roberson, Peter Calamai, et al., each tale involving some supernatural element Foreword by David Stuart Davies. "Queen Victoria's Book of Spells: An Anthology of Gaslamp Fantasy" - features eighteen stories, all of which are set in a magical version of the nineteenth century. The anthology is edited by Terri Windling and Ellen Datlow. Girl Genius: A webcomic featuring an alternate earth (badly) ruled by Mad Scientist archetypes. ↑ Marissa Meli. "Hilarious Web Comics for Your Interweb Perusal Pleasure: Finally, a way to waste time on the internet". UGO.com. UGO Entertainment, 11 May 2011: 3. Web. 13 June 2011. ↑ Foglio, Kaja (2006-04-26). "Dirt, Collection Vol. 5, Furniture and Gaslamp Fantasy". Retrieved 2008-12-03.